Pa kimchi is made with tender green onions (also called scallions). It’s a popular kimchi in the spring, when jjokpa is in season. Jjokpa is a small variety of green onions that has dark green leaves and slightly bulged out white stems. They are sweet with a nice aroma, making it perfect for dishes such as pa kimchi and pajeon. If jjokpa is not available, use silpa which simply is regular green onions that are harvested early when they are young and tender. 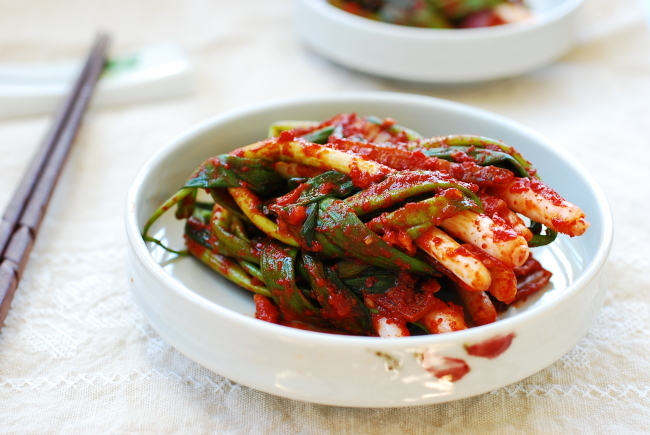 Typically, pa kimchi is seasoned with myeolchi aekjeot (fermented fish sauce made with anchovies). You can substitute it with soup soy sauce for a vegan version. In this recipe, I also used dried squid, which is a popular snack in Korea, but it’s absolutely optional. The squid works as an umami booster while adding an interesting chewy texture to the kimchi. Cut the dried squid into about 5-centimeter long thin strips. Soak in water until slightly softened if very dry and hard, but this is generally not necessary. Gently rub the seasoning mixture all over the green onions to evenly coat them.